If you lived here you, too, could put magnets on your fridge! Yes! You could! It's not one of those no-magnets-here fridges! I like the washing machine in place of a dishwasher in the kitchen. It makes it that much easier to wash a load of clothes whilst whipping up a nutritious meal for the family. The only thing missing from that refrigerator is a magnet featuring a merman named 'Clint'. All kitchens should have one of those. Why DO agents do this? Ok, ok, yes, I get that that's the whole point of this blog: it's weird, and possibly inexplicable. 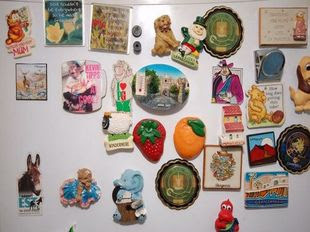 But seriously, does anyone have any clue why anyone would bother putting up a photo of stuff on the fridge? Is there some rational reason, like it's supposed to show what kind of people live there? "Oh yes, owned by a little old lady who only left the house to go to church on Sunday"? You mean "people who don't like *expensive* stainless steel appliances." The cheap stainless fridges are magnet friendly. I actually like this house. Not only would we still be able to use our magnets, but my hubby and I could have our separate beds and wash clothes while we do the dishes. I'm with apronk on this one. Any surgical grade (400 series) stainless will hold a magnet. Please try to verify all ferous and non ferous properties before posting. A lot of people look to this blog for information and opportunities for house flipping. When you quote misinformation you realy skew the market. You tell her, Gamzulatov! That'll teach her to not research the properties (and their appliances) completely before posting them on her blog! I have stainless, but it's covered in magnets and school papers too. At least I don't need to clean it that way. OMG! I thought you had zoomed in on a picture of the frig and the magnets! Wow! It was an actual photo in the listing. Lovely, indeed. OMG! It's my grandparents' refrigerator in 1986. Now that's a selling point. I'm in. Interesting choice of magnets. Not much of a leprechaun fan, but the evil president of Jamestown (as portrayed in Disney's Pocahontas) is lovely. Are they trying to get the first-time homebuyers with their memory-inducing magnets? k2-judgment day, it's very common in the UK to have the washing machine in the kitchen, usually unaccompanied by a dryer. Most British houses were built before the existence of washing machines and dryers; the middle class who would have lived in these places sent their laundry out. So these houses don't have laundry rooms, and quite often it's much cheaper to retrofit a washing machine to sit beside the sink because that's where the pipes are. Dishwashers aren't all that common and aren't taken for granted as a necessity. To me it's insane that they don't have clothes dryers right beside the washers. If York is anything like where I live, clothes can only be dried outside for two or three months a year. What do they do the rest of the year? My family has a huge collection of fridge magnets that we've accumulated over the years from every place we've ever visited - hence we have fridge magnets from all over the world. It's one of those random collections that some people make, I guess, and it's considerably larger than the one in that picture. When we needed to buy a new fridge, we even made an effort to hunt for a fridge that would allow us to continue sticking our magnets while giving us the usual functionality needed from a fridge. Yay another of my finds on the blog!! As a quick note most homes in the UK don't have a laundry room. It's very common for the washing machine to be in the kitchen - generally the place with best access to water. They are just looking for the right magnet aficionado for a buyer. If it's like my friend's, it's not just a clothes washer, it has both a wash and a dry cycle. Though if it has no dry cycle, perhaps the fridge magnets hold the clothes up for interior drying?